Posted April 7th, 2019 by Mike Boyes & filed under Consciousness, Emerging Adulthood, Neuroscience, Personality. Description: While it might seem like ancient history to some the 1960’s were not that long ago (well OK, it was over 50 years ago). What have you heard or read that the 1960’s were known for? Student activism, Vietnam war protests, and experimentation with recreational drugs. Related to all of those things was an intense interest in raised consciousness. Students becoming aware of the nature of the social structures around them (e.g., the military industrial complex) was one form of consciousness expansion. The use of psychedelic drugs such as LSD and peyote were also viewed by many as consciousness expanding experiences. 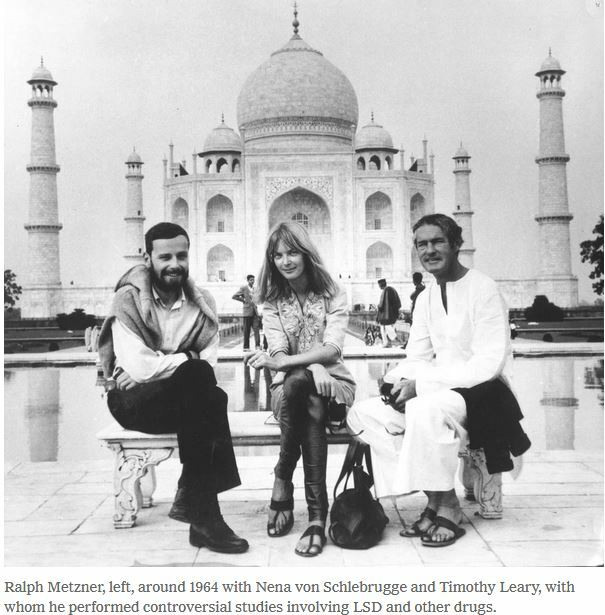 Ralph Metzner, who passed away recently, was a psychotherapist and researcher who had an intense interest in the potential implications and applications of psychoactive drugs. He worked with personality psychologist turned counter culture guru and LSD advocate Timothy Leary on experiments on the effects of LSD. They were dismissed from Harvard in 1963 for giving LSD to students as part of their investigations. Later Metzner wrote a book with Leary and Richard Alpert, a clinical Psychologist who took the name Ram Dass (servant of God) called The Psychedelic Experience: A manual Based on the Tibetan Book of the Dead. While Leary and Alpert moved wholesale into the counter culture movement Metzner remained in academia writing and conducting research. It was an interesting time and involved some broad speculations about the nature of human consciousness and the potential roles played by psychedelic in expanding consciousness. Have a read thought the article linked below to get a glimpse of the 1960’s influence on thought and experimentation (at a number of levels) into consciousness. So, what do you think? Lawrence Kohlberg, a developmental psychologist who studied the emergence and development of moral reasoning looked at the level of moral reasoning used by those university students who were most actively involved in the free speech movement at Berkley in California. He found that while many of those actively involved scored as using the higher moral reasoning levels in his model there were a small subset who scored at one o his lowest stages, focused primarily on self-interest. As a statement about the 1960’s this suggests that while some emerging adults at the time were involved because the parties were good and interesting recreational drugs were available there were also many who were thinking hard and trying to discover new ways to be. Ralph Metzner took that sort of approach to psychedelic drugs and consciousness. You can read further about his explorations by following some of the links below in the References section. Why were individuals like Ralph Metzner and Timothy Leary interested in the effects of psychedelic drugs? Can you see some ways in which interest in psychedelic drugs is related to interest in drugs that can positively influence the symptoms of psychological disorders like schizophrenia? What sorts of ethical issues should be considered if one were to be interested in studying the effects of psychedelic drugs on human consciousness? Leary, Timothy, Ralph Metzner, and Ram Dass. The psychedelic experience. Smithsonian Folkways Recordings, 1966. KUTNICK, P. (1986). Judgment and Moral Action: Kohlberg’s Theory, Criticism and Revision. Lawrence Kohlberg, Consensus and controversy, (1), 125.